ATM is a London-based artist whose paintings of rare and endangered British birds are appearing around the capital. His love of nature is evident in the staggering levels of flair and detail with which he paints these birds. 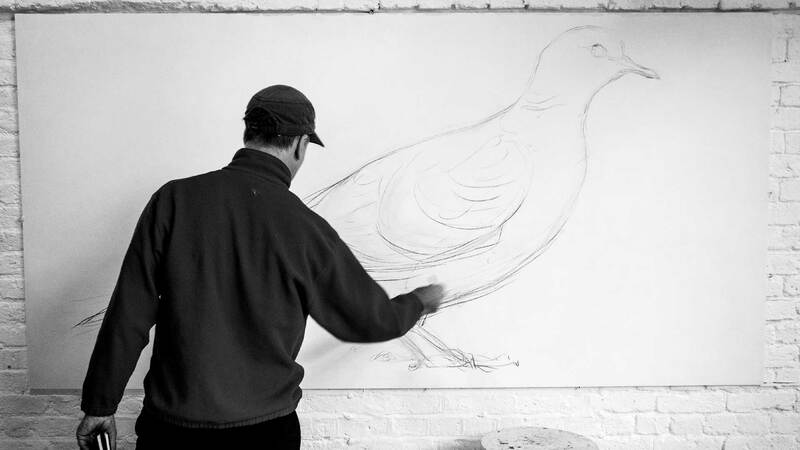 In 2014 he started painting street art in east London, completing a three metre tall image of a great bustard on a black-painted brick wall off the Whitechapel Road. His paintings have since begun to thrive across the capital. ATM grew up in a mill town in northern England and went to art college in Sheffield. As a child I used to wander not far from town in steep-sided valleys that were thickly wooded and lined with streams and ponds. Insects, amphibians and above all birds were abundant. Birds have always meant a lot to me. I have loved their songs since I was very young. They are also incredibly beautiful. It’s their balance and co‑ordination, their markings. I also love birds because I love the wild places where they live, and I associate the two with each other. But, when as a student I painted birds, the common response was ridicule. After college my painting was inspired by two passions: ancient Greek and Roman myths. Myths shed light on the darker forces in human nature. In myths the unwitting acts of human beings are severely punished by the gods. This speaks to the way we live. The wiser counsel is often ignored; we pretend the environmental side effects are not really happening. We see progress on one level, but at a hidden level the opposite is going on. The warning signs are there for those who care to notice in the loss of the profusion of wildlife I knew as a child. Once-common species such as lapwings, yellow wagtails, skylarks and kestrels have declined in numbers. It has never been more urgent for humans to connect with nature.